2 x 196-2 Spirit Levels (60 & 120cm), made from extra-strong light metal. They have a rectangular profile and an extra-strong ribbed frame, with rubberised hand holds. Their removable end caps incorporate anti-slip wall pads, which allow the level to be held firmly against a wall with one hand without slipping. Each level has 2 vertical vials and 1 horizontal vial. The levels have 2 milled measuring surfaces. Measurement Accuracy: Normal Position:0.029°=0.5 mm/m, Overhead: 0.029°=0.5 mm/m. 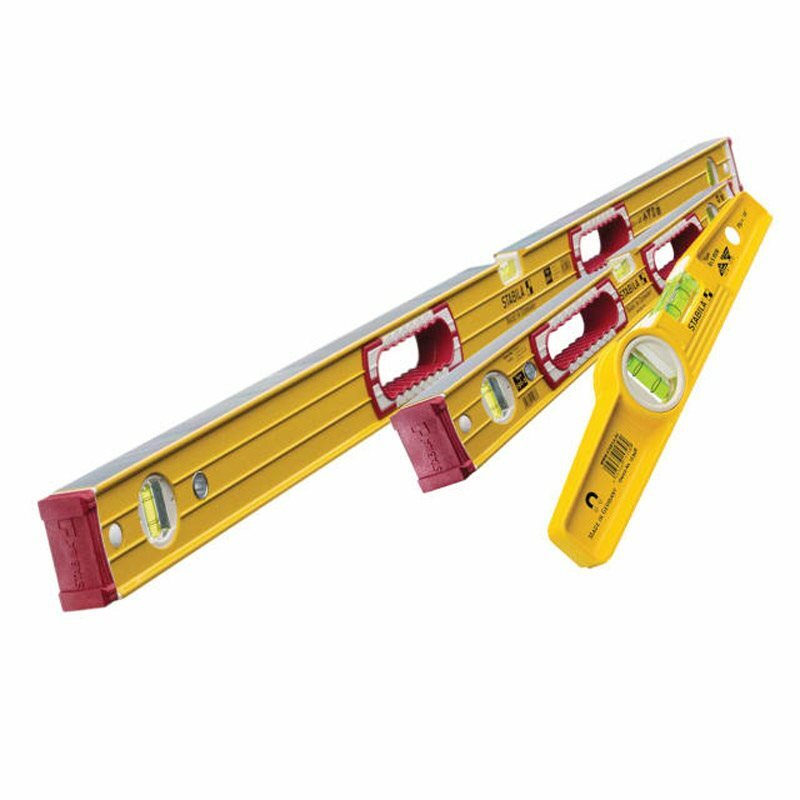 1 x 81 S REM Torpedo Spirit Level with rare earth magnets (five times stronger) and a strong cast aluminium T-profile making it easy to hold. The particularly slender trapezoidal bevelled shape makes it suitable for working in cramped spaces. The die-cast frame has 1 milled measuring face and protecting noses to prevent damage to milled face. Additional magnets mounted in the milled measuring surface securely hold this level to scaffolding or beams. Measurement Accuracy: Normal Position:0.029°=0.5 mm/m, Overhead: 0.043°=0.75mm/m.